The simplicity and lack of redundancy in their regulatory genes have made ascidians one of the most useful species in studying developmental genomics. In Developmental Genomics of Ascidians, Dr. Noriyuki Satoh explains the developmental genomics of ascidians, stresses the simplicity of Ciona developmental system, and emphasizes single-cell level analyses. 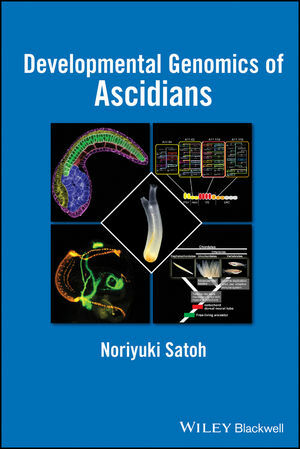 This book actively accentuates the advantages of using ascidians as model organisms in an up-and-coming field of developmental genomics. Dr. Noriyuki Satoh has conducted research on ascidians at the Kyoto University Department of Zoology for more than 35 years. In April 2008, he launched the Marine Genomics Unit at OIST and extended his studies from ascidians to other marine animals, such as the corals that abound in the marine environment around Okinawa. On February 2, 2011, he was awarded the title of professor emeritus by Hirosaki University in Aomori Prefecture, Japan. The university recognized Dr. Satoh as one of Japan's leading biologists, who received the Zoological Society of Japan Prize in 1991, the Inoue Prize for Science in 1992, Toray Science and Technology Prize and the Japanese Society of Evolutionary Studies Prize in 1994, and the Medal with Purple Ribbon awarded by the Japanese government in 2006. In 2005, Dr. Satoh became the first Japanese scientist to receive the Alexander Kowalevsky medal, which is awarded to scientists for achievements in comparative and evolutionary embryology. In 2010, he also became the first Japanese scientist to receive the Edwin Grant Conklin Medal by the American Society for Developmental Biology (SDB). The SDB gives the award yearly to recognize a developmental biologist who has made and is continuing to make extraordinary research contributions to the field, and who is also an excellent mentor in training the next generation of outstanding scientists. By awarding the title, Hirosaki University also recognized Dr. Satoh's other various distinguished contributions, including the establishment of the Asunaro Prize in the Faculty of Agriculture and Life Science in 2008. Dr. Satoh founded the prize to enhance the university's research level in life science, and to nurture young scientists by recognizing students who have produced outstanding research results.